Forward British 19th C, except portraits, North East England: Artists and Subjects 8 comments Could this be Barnard Castle? Are there any other suggestions for a location? 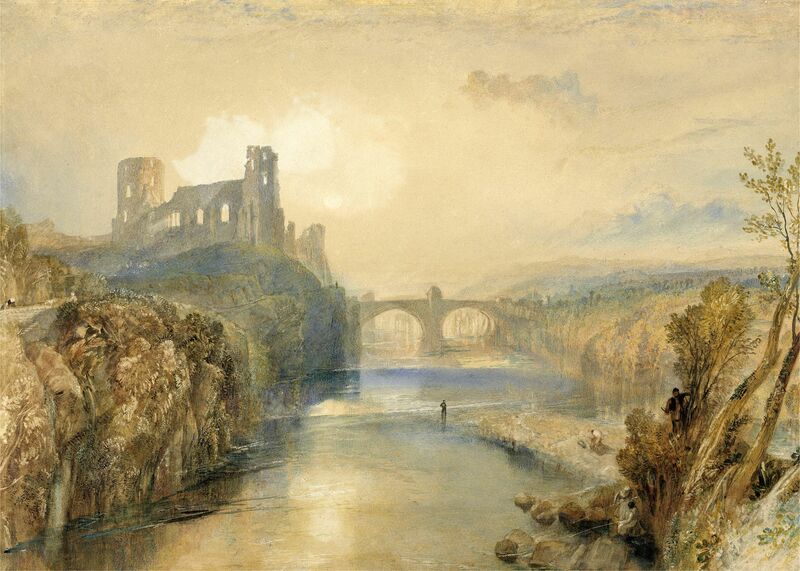 I agree that it looks like the same castle and bridge as shown in the picture by Thomas Creswick. I agree this looks very much like Barnard Castle. I live up the road in Durham and cross this bridge quite often. The tower, the walls, the footpath around the tower and the bridge are correct. Turner's picture has some embellishments but then he often did enlarge on nature, see his alpine-like depiction of the river at Tynemouth. showing a picture to compare. I too have little doubt that this is of, or at least based on, Barnard Castle. The image is simplified and romanticised, but there are too many similarities to be coincidental. With a consensus of seven different people I am happy to recommend that this can indeed be identified as Barnard Castle. The little tower on the central pier of the bridge seen in earlier views seems to have disappeared towards the mid-19th century so this view can be probably dated to then or shortly afterwards. Stylistically I don't think it can be much later in the century. And I am never the worse'. However, the 1833 engraving, by Samuel Lacey (1786-1859) after Thomas Allom (1804 - 1872), does not include it, suggesting that the edifice must have disappeared sometime between 1816 and 1833. This discussion's painting must, therefore, date from the mid-to-late late 1820s at the earliest.